Bogus debt collectors. Imposter IRS agents. Phony sweepstakes. These types of scams pose a threat to virtually every American – and savvy scammers use every trick in the book to gain trust, such as building rapport, using professional-looking websites, and even playing on emotions. But how prevalent are these deceptive practices? We wanted to find out for sure. Using the Better Business Bureau’s online Scam Tracker, we mapped thousands of reported scams to pinpoint where each is most common. How does your state stack up? Read on to discover the most common scams across the country. 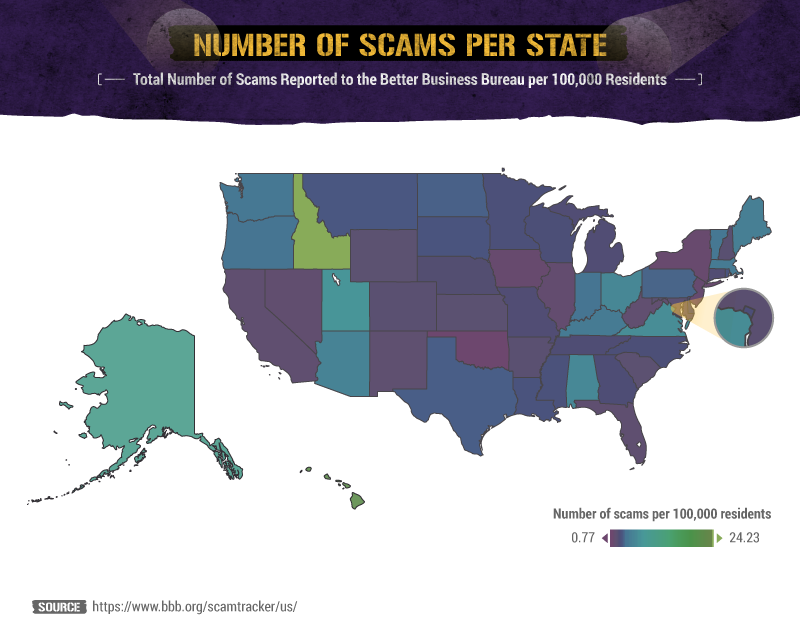 Across the U.S., vast differences exist in the number of scams reported in each state. Idaho is the most fraud-ridden state by far, with a whopping 24 scams reported per 100,000 residents. Why? A glance at the Idaho Attorney General’s website and the news reveals that scam attempts are abundant. For one thing, many Idaho counties reported an increase in scam phone calls from people posing as IRS agents – in fact, Idaho had nearly double the number of reports per capita of imposter IRS agents as the next-highest state. Additionally, millions of Idahoans were affected by last year’s U.S. government security breach, and the ensuing fallout may have contributed to the high numbers: Some recipients of the letter that informed them of the breach believed it was a scam and reported it to the BBB. To compound matters, con artists took advantage of the data breach by attempting to dupe victims. Other scam-ridden states include Hawaii (nearly 22 per 100,000 people), Alaska (almost 11), Utah (nearly eight), and Virginia (nearly seven). On the other end of the spectrum, Oklahoma is the only state in which people reported fewer than one scam per 100,000 residents. The state has beefed up its efforts to combat some types of scams – specifically, Medicaid fraud and auction, lottery, or sweepstakes scams. Which other states reported the fewest frauds? Arkansas, California, Florida, Iowa, Illinois, Kansas, Maryland, New Jersey, New Mexico, Nevada, New York, South Carolina, West Virginia, and Wyoming all saw fewer than two scams per 100,000 residents. 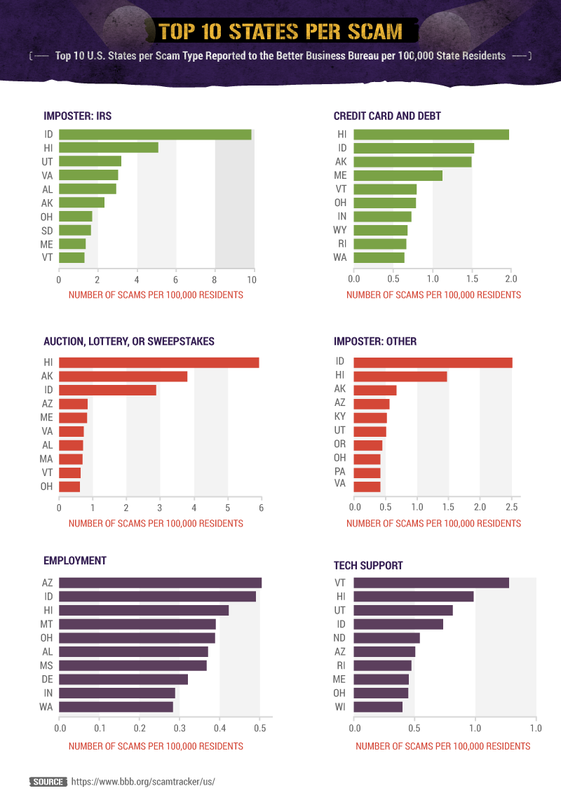 On average, each state reports four scams per 100,000 residents; however, a great deal of disparity exists among states. 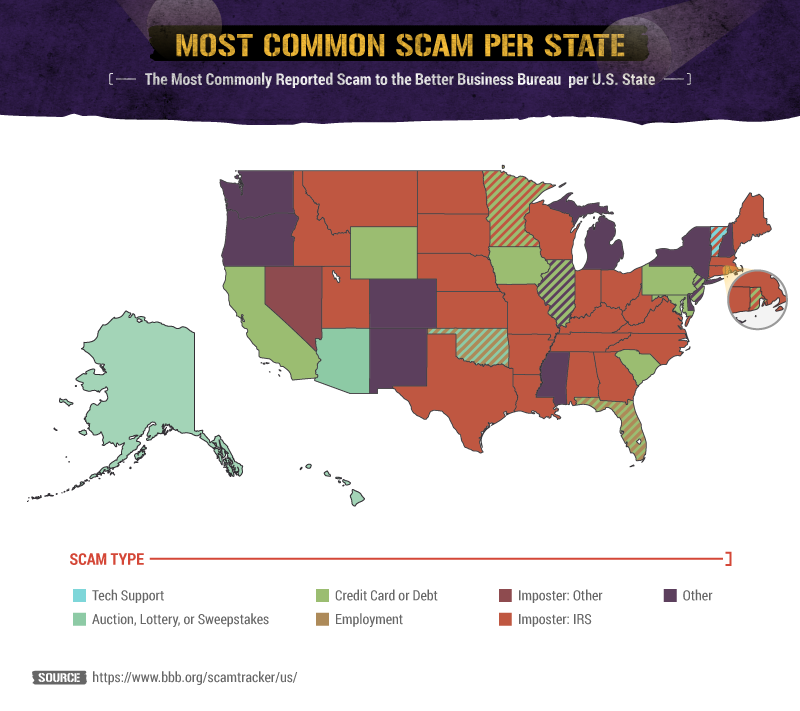 Only 15 states report four or more scams on average. Idaho, at 24, reports a number six times greater than average, while Hawaii sees more than five times greater. On the other end of the spectrum, many states fall well below average: Oklahoma sees fewer than a quarter of the average number of scams. 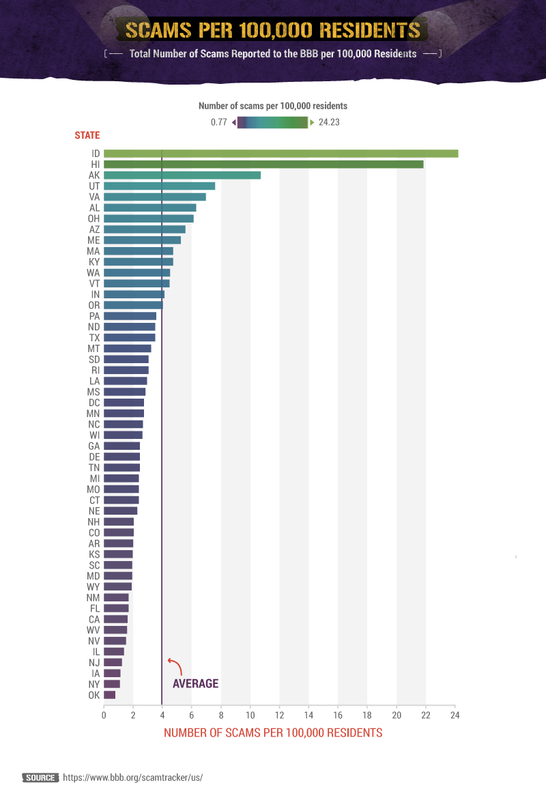 Additionally, New York, Iowa, New Jersey, Illinois, Nevada, West Virginia, California, Florida, New Mexico, and Wyoming all report fewer than half of the average number. It’s a phone call that can catch even the savviest consumer off guard: “I’m calling from the IRS, and our records show that you owe money; if you don’t pay, you could go to jail.” Scammers may even spoof the caller ID to display “IRS.” This type of imposter IRS agent scam dominated BBB reports in many states – in fact, it was a problem in every location but D.C. In South Dakota, the IRS scam comprised more than half the reports; in Idaho, Utah, Virginia, Alabama, and Tennessee, it accounted for 40% or more. Other scams that stood out: In D.C., more than 20% of scams were fraudulent offers of government grants – no surprise given the plethora of government agencies in the area. In Vermont, nearly 29% were phone calls from people posing as helpful computer techs; in reality, they are hackers who are actually trying to steal money, access passwords, and/or install malware. In Alaska, 35% of reports were phony auction, lottery, or sweepstakes wins, which tend to involve one of two scenarios: A consumer receives a letter, email, or phone call announcing they’ve won money and must pay a processing fee or tax to claim it; or they receive an unsolicited check or money order with instructions to deposit it and wire a portion back – however, the counterfeit check bounces, and consumers are on the hook for the money they wired. Mapping the highest number of reports of each type of scam in the U.S. reveals a few surprises: The imposter IRS agent scam topped the list of reports (or tied for the top spot) in 27 states. Credit- and debt-related scams (including credit repair, debt relief, debt collection, and credit card ruses) made up the brunt of reports in 12 states. Credit repair or debt relief scams involve shady businesses that promise to fix a consumer’s credit in return for payment and may recommend consumers take illegal steps, such as inventing a new credit identity. Debt collection scams refer to con artists who pose as legitimate debt collectors and threaten lawsuits, jail time, and wage garnishments if people don’t pay up. And credit card scams involve scam artists who pose as banks or credit card companies promising lower rates in order to obtain consumers’ credit card numbers. In Florida, employment-related scams (such as fake work-from-home or secret shopper gigs that result in stolen identity or involve stolen goods) tied with credit or debt scams for the top spot. In Oklahoma, employment-related ruses and auction, lottery, or sweepstakes frauds each comprised 20% of scams. Vermont’s two top scams tied as well: Faux tech support scams and IRS imposter scams made up nearly 29% of reports apiece. 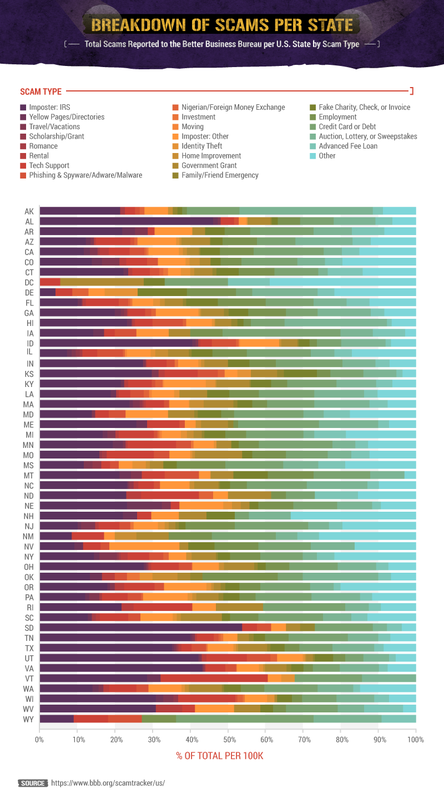 Finally, in 12 states, the most frequent reports fell under the “other” category. We’ve covered which types of scams dominate which states – but how many reports are we talking about? In 2015, the BBB received 2,350 reports of IRS agent scams, which is nearly twice as many as the next-highest type: credit-related scams, weighing in at 1,238 reports. Other common scams include bogus auction, lottery, or sweepstakes wins (1,051); imposters (767); and fake employment offers (631). On the other end, receiving only seven reports, the least common type of fraud is a moving scam (in one scenario, for instance, a dishonest moving company may hold a consumer’s belongings hostage in hopes of receiving an exorbitant fee). The BBB received only 20 reports of romance scams – online dating ruses in which scammers “catfish” victims, ultimately requesting money. And only 24 reports of fake scholarship or grant offers rolled in. Breaking down reports by scam type offers a unique perspective. 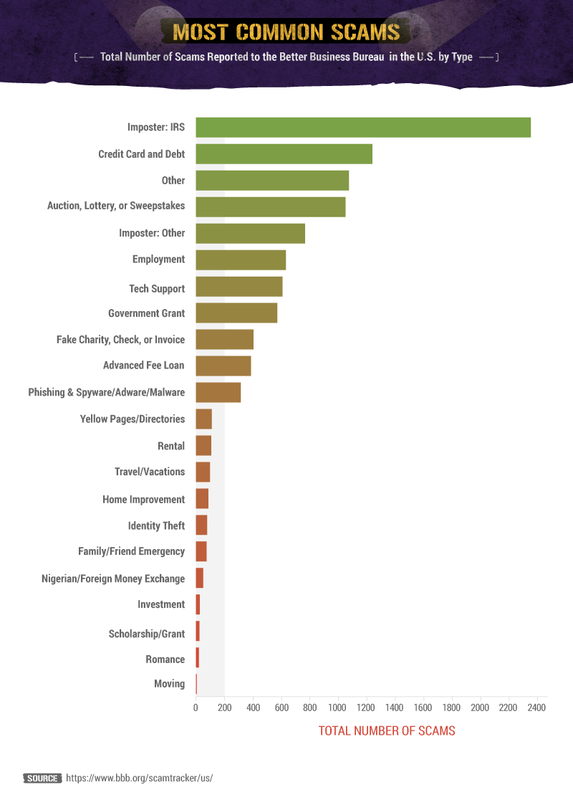 As noted above, Idaho appears to be a hub for scam artists: The Gem State tops the list for two categories (IRS imposters and Medicare or Medicaid impersonators); occupies the second spot for credit-related scams and employment-focused frauds; takes third place for auction, lottery, or sweepstakes scams; and takes fourth place for tech support ruses. Hawaii, too, is a hotbed for scam artists and is the top state for two types of scams: auction, lottery, or sweepstakes scams and credit-related scams. Additionally, the Aloha State ranks second in tech support scams, IRS impersonator scams, and Medicare or Medicaid imposter scans, as well as third in employment-related ruses. Arizona tops the chart for employment-related scams, and Vermont takes first in tech support scams. You may feel like it could never happen to you. But these discoveries offer a sobering reminder that scams can – and do – happen with alarming frequency in this country. That phone call from your credit company may, in fact, be from a con artist. And that nice man on the phone offering to update your antivirus software may be a talented scammer. The best way to guard against scams is to educate yourself. Take the time to do research on an organization before making any decisions, don’t give out personal information on the telephone, and never click links from strange texts or emails. For more advice on safeguarding against scams, visit www.consumerprotect.com – an organization dedicated to protecting consumers from unfair and unsafe business practices, products, and technologies. Using the Better Business Bureau’s Scam Tracker, we gathered and analyzed data on all scams reported in the U.S. from February 13, 2015 to December 4, 2015. Zip codes from each report were converted to the state level and adjusted per 100,000 state residents. Feel free to share the images found on this page freely. When doing so we kindly ask that you attribute the authors by providing a link back to this page so your readers may learn more about the project and view any additional graphics.